Casa Alimas is licensed by Câmara Municipal de Lagos (the local council) as meeting all requirements of the Alojamento Local (AL) legislation for holiday rental properties. Registration number: 3890/AL. This spacious detached holiday villa is set in a peaceful location, a short walk from the centre of Praia da Luz and the beach. The 3 bedrooms (one double and two twins) usually accommodate up to six people, but can comfortably accommodate eight people. New bathroom and shower room added (2012), so each bedroom now has ensuite facilities. A spiral staircase, with child gates, leads upstairs to the large, fully equipped kitchen and the lounge/dining room. Three sets of patio doors lead onto the broad balcony with beautiful views over Luz and the Atlantic Ocean. The large 10m x 5m swimming pool is walled for privacy with areas for sunbathing on all sides. The gardens are well stocked with flowers and fruit trees. An almond grove in front of the villa adds to the sense of peace and privacy. Fully equipped, including Air Con, broadband wifi, Satellite TV ( UK channels), DVD, VCR, CD/Radio/iPod player, telephone, dishwasher etc. Ideal for family holidays. Private parking for three cars. Praia da Luz is developing into a busy resort in the peak summer, but Casa Alimas offers a peaceful position accessible along a cobbled lane in the centre of Luz. The beach, shops and restaurants are all within 10 minutes walk of the villa. There are many good restaurants in Luz and even more in Lagos. The beach is protected by the famous 'Black Rock' headland and is very popular with the Portuguese. There are many quieter beaches within a short drive. The local villa management company can arrange many local leisure activities for you, such as tennis, water sports and horse riding. Lagos and the Algarve: Between Luz and Lagos there are spectacular caves and grottos, accessible from land at Ponta da Piedade or by sea from various boat trips out of Lagos. The historic town of Lagos is just 10 minutes drive from the villa and has a wide range of good shops and restaurants. The main street fronts onto the river and the elegant marina. There are numerous beaches both to the East and the West of the villa. Other attractions include Zoo Marine - a seaworld park; Family Water Parks; Lagos Zoo (a small but very attractive zoo); Monchique and the hills, Cape St. Vincente ('The end of the World'); and the wilder West Coast. The nearest golf course is at the new Boavista resort just outside Praia da Luz. There are numerous other courses all along the Algarve. Booking Information: Bookings for Casa Alimas are managed in the UK - send us an enquiry via holiday-rentals in the first instance after checking the availability chart. During your stay, a local villa management company is on hand to deal with any queries you may have. toilet, combination tub/shower, shower, Fully upgraded in 2012 with direct access from 2nd bedroom. toilet, combination tub/shower, shower, Completely refurbished in 2014 with spacious walk in shower. Each bedroom now has access to its own bathroom, with a new ensuite built for bedroom 3; the main bathroom converted so it has an entrance directly from bedroom 2 and the bathroom for bedroom 1 fully modernised with a walk in shower in addition to a bath. Each bathroom has heated towel rails and room heaters. There is a telephone, which can be used to receive calls and make local calls. Guests are expected to pay for other calls. Air conditioning is available in the lounge and all the bedrooms. The aircon can be used to heat in winter as well as cool in summer. Linen is provided, with duvets used on all beds, plus sheets, pillows and pillow cases. The washing machine is located in the main bathroom downstairs and a rotary line is available in the garden. Powder/conditioner not provided. Fast wireless broadband is provided. Towels are changed typically twice per week. The maid will provide you with additional towels on request (although not a hotel-style daily change). Please bring beach towels for pool use. Wireless broadband internet is available to guests free of charge. There is a wood burning stove in the lounge, which can be used at cooler times of the year. There is usually a stock of wood available and guests can order more from the management company. The living room on the first floor has three sofas (for 8), coffee table, entertainment centre, book shelves, widescreen TV, with sea views. There is a full size Zanussi dishwasher in the kitchen. A new large fridge-freezer was installed in 2015. There is a four-burner gas hob and gas oven. There is a full set of dishes and utensils (enough for eight people). Located on the first floor, next to the lounge. It includes a breakfast table seating 4, double sink unit, plenty of work surfaces and cupboards. The spacious lounge includes a dining area, with a glass-topped table and 6 chairs. This is by one of the patio doors leading onto the balcony, where there are two further tables and chairs outside. Widescreen TV with free to air UK channels available via Internet TV. There is also a Chromecast device enabling you to stream content to the TV from your own laptop, tablet or smartphone. An iPod/iPhone docking station is available in the lounge, plus a portable CD player. There is a large selection of books available for you to read - take one and leave one. There's a collection of board games including Chess, Monopoly, Cluedo, Scrabble and Jenga blocks. There is a small but growing collection of DVDs available at the villa. The garden is well stocked with fruit trees. The spacious balcony is a key feature of the villa, accessible via three patio doors from the lounge. Ample room for outdoor eating and great views of the Atlantic and the surrounding countryside. The upstairs balcony can be used for alfresco eating. There are also ground floor terraces. The staircase between the ground and first floors make this villa largely inaccessible for wheelchairs. There are also a couple of steps down to the pool patio. The villa's private pool measures 10m x 5m, with steps at the shallow end. It is about 0.5m deep at the shallow end; 1.8m at the deep end. There is a retractable pool cover. Not heated. A split cooling/heating air conditioning system is provided in the living rooms/bedrooms, providing a pleasant environment in both hot and cold conditions. Child gates and safety rail on the spiral staircase. Older guests are welcome, although of course the property is on two floors. The stairs are quite easy to negotiate and there are grab rails in the bathrooms. Marina the maid visits each weekday afternoon to clean, look after the linen and towels and to care for the garden. The spacious upstairs balcony has a built in charcoal barbecue. The entertainment facilities in the lounge includes a widescreen TV, satellite TV showing basic UK channels, a DVD and VCR. There is an iPod speaker system and a stereo radio/CD/Cassette player. Wireless Broadband Internet Access available. We have stayed at Casa Alimas before and we really love it. It has spacious rooms and a very airy feel. It is well equipped and well kept. The pool is larger than average, so you can have a proper swim. We enjoy walking down into the centre of Luz - just a short walk. Another really peaceful holiday in the sun! Very nice private home close to everything with a great view. This is a very nice and clean home that has everything that you need for a nice vacation. We did not get to use the pool because it was winter, but it looks like it would be great in the summer. We highly recommend this house. We ate oranges and clementines from the trees in the yard. It is very quiet and private and safe. Three bathrooms are a plus. The view is great. I'm glad you had an enjoyable stay at Casa Alimas over Christmas - many thanks for the review and I hope we can welcome you back soon! The property was clean, spacious and well equipped. We loved the balcony and the large pool. We had a great time, enjoying the solitude of Casa Alimas, while finding it an easy stroll to the beach, restaurants and bars. 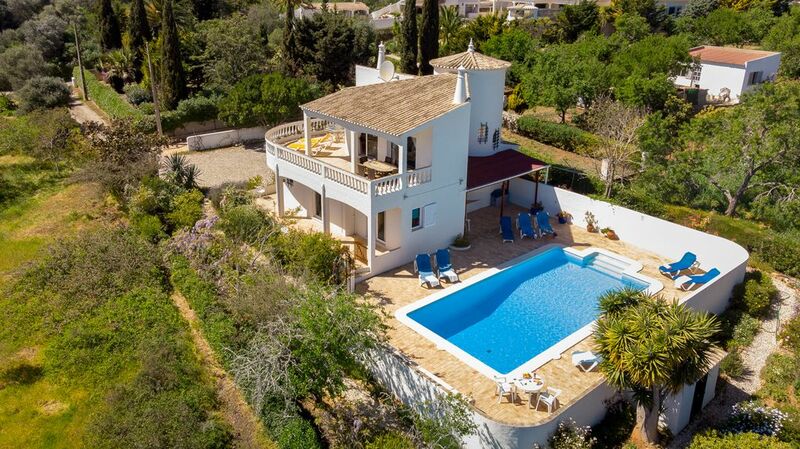 Casa Alimas is a lovely villa with lovely views of the country and sea. The pool was one of the biggest we have had and although unheated it was fine once you got in. You do not need to hire a car if you just want to walk into town as the villa is about a 10 minute walk if that from the nearest restaurants. However if you or any of your party have mobility problems then I would advise you to get a car as the road to the villa is all cobblestone and uneven and when wet can be a bit slippery. The beach was lovely and very well maintained. The villa is clean, well maintained and Marina the cleaner was excellent. Would definitely stay here again. We stayed at Casa Alimas for 1 week recently. We found it to have all the necessary facilities to have an excellent holiday. The bedrooms were spacious each with their own, what appear to be, new en-suite bathrooms. The kitchen was well stocked with all kinds of cooking utensils which we enjoy because we like to put the odd meal together. The pool is a real treat with plenty of shade in the afternoons for pale folk like me. There is a really good barbecue which we used a few times and had some great meals overlooking the sea from the upper patio. It is also a short walk into the town although a bit steep coming back and a bit rough underfoot in parts. The customer service from both the owner and the on site management was excellent and overall I couldn't really fault the place. I would have awarded 5 stars if the bath towels had been bigger and the pillows and bedding better quality however all in all I would heartily recommend this place. Lovely villa, well presented, clean. we enjoyed our stay immensely. Even the steep hill up to the villa was regarded as necessary exercise !! Maid service and villa management was very good. Only minor problems with TV service (which we were made aware of) and the cooker looked past its best. That said, we would not hesitate to recommend the villa. All the bars and restaurants we went to were good to great, and we would recommend Onda Luz, Chicca's and Alloro. Many thanks for your very positive review, Keith. With regard to the TV service, just to clarify for other potential guests - most satellite services carrying UK TV channels were switched off early in 2014 affecting everyone in the Algarve. Our short term solution is a IPTV box (streaming over the Internet) and this has not been without problems, which we hope to solve before next season. With regard to the cooker - this is not at all old, but I will review it on my next visit. Praia da Luz is a family resort in the Western Algarve, just outside the attractive town of Lagos. The Blue Flag beach at Luz is a ten minute walk from the villa. At one end of the beach the Black Rock dominates the bay, with its remnants of volcanic activity. At the other end there are rock pools. In between there's a long stretch of golden sand. The paved promenade has a small number of shops and cafés along its length. There are plenty of restaurants in Luz and a good supermarket - all within 10 minutes walk from the villa. With the opening of the A22 motorway, it's a 50 minutes to drive from Faro Airport. Luz is an ideal location to enjoy the local beaches or to explore the rest of the Algarve. The historic town of Lagos, with its wide selection of shops, restaurants and its marina, is just a short ten minute drive away. In the other direction, it's a thirty minute drive to the 'end of the World' at Cape St. Vincent (Cabo de São Vicente). The Changeover day is usually Saturday, but we can be flexible. Rates shown above are for 7 nights. Additional nights pro rata. Min. booking is 5 nights. Prices are for up to six persons, inclusive of maid service. For occupancy over 6 persons a small supplement of £35 per extra person per week is payable. Broadband Internet is now provided to guests free of charge.